Normaderm Capsules, we offer, are widely used for treating all types of Bacterial and fungal infections, Eczema, Sunburn, Allergic Dermatitis Eczema, Sunburn, Allergic Dermatitis and Kadar (corn). 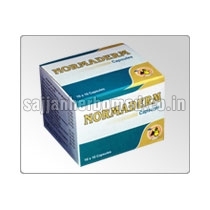 NORMADERM Capsules are free from side-effects and made using haritaki, bibhitaka, amalaki, nimba, guduchi, manjishtha, sariva, khadira, bhringaraj shodit gandhaka, shuddha guggulu, haridra and These capsules help in normalizing Roughened, Hardened and Cracked skin. They aid in combating secondary infections of the skin as in Diabetes.